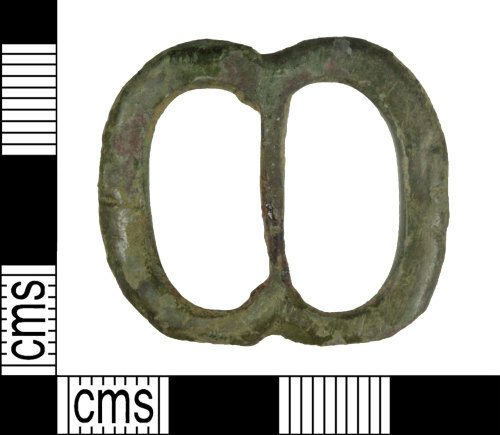 An incomplete medieval to post-medieval copper-alloy double-looped buckle (c AD 1350 -1650). The pin is missing. The frame is convex at the front and flat at the rear. It is bevelled at the edges on the top. Each loop is oval in plan and they are evenly sized. The buckle is 'waisted' with a narrow bar dividing the two loops at the narrowest point. The bar is triangular in cross-section. The buckle is 30.85 mm in length (across both loops), 24.73 mm in wide across the waist and 26.76 mm wide across the tallest loop. It is 2.20 mm thick and weighs 4.48 g.